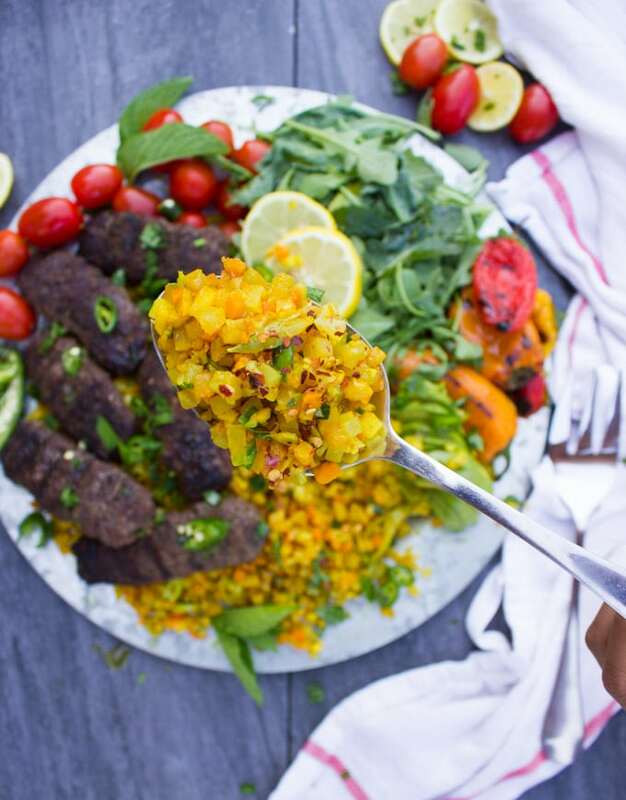 Here’s Summer’s most delicious entertaining platter, a Turmeric Cauliflower Rice and Kebab Platter! 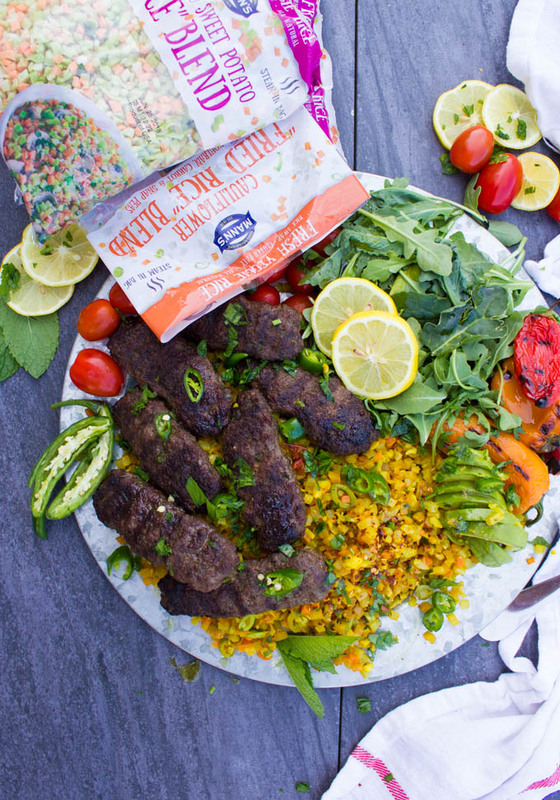 It packs, flavor, spice, colors, textures and so much goodness for you! I’m pumped to be working with one my favorite brands again, Manns Veggies— suppliers of the best, freshest and tastiest veggies ever. All opinions and thoughts are my own. There’s something about an entertaining platter that’s always a hit, specially in the summer! There’s something for everyone, there’s plenty to go around and today’s cauliflower rice platter is all that plus SO MUCH flavor! If you’re a cauliflower hater, wait. My sister is like that so I imagine this is probably a thing. But guess what, cauliflower rice is something else. She says so herself. I promise. 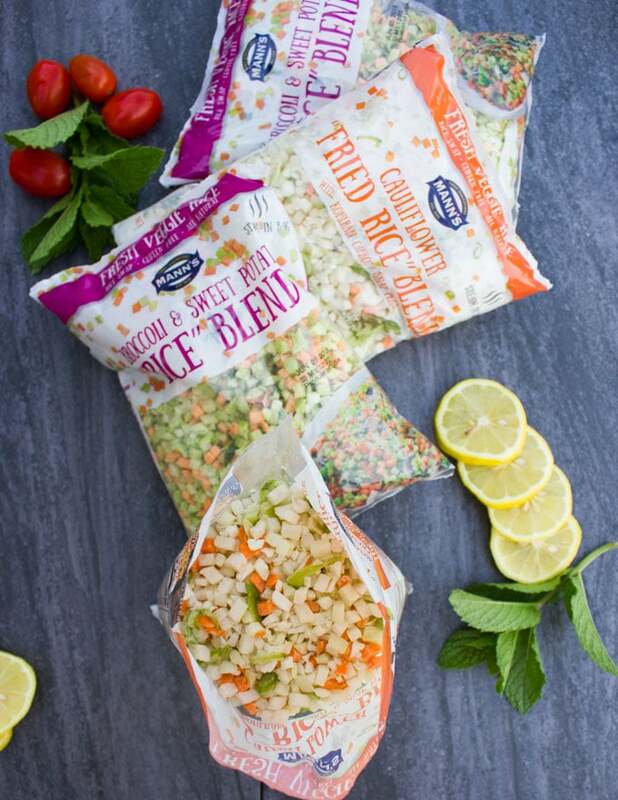 And the new Mann’s Fresh Veggie Rice collection is absolutely worth trying!! While obviously you can make cauliflower rice on your own, but making this fabulous combo of cauliflower, kohlrabi, carrots and snap peas is certainly not a homemade thing. Plus when you buy the Mann’s Veggies blend, it’s guaranteed to be fresh. Every single bag of it. So that’s the first tip—buy the Mann’s cauliflower rice blend. You can cook the cauliflower rice in the microwave. YES. I’ve been sharing how I made this delicious platter on my Instagram stories, so check that out too. Just place the bag as it is in the microwave for 3-4 minutes until it puffs and the veggies are cooked. To make the cauliflower rice on the stove, which is my favorite way, you’ll need a sauté pan and lid. And you can add any flavoring you love! So I sauté garlic with olive oil before adding in the cauliflower rice, then add all my spices and cook the rice for just 5 minutes. Yes it’s that easy! The spice I chose here is turmeric. 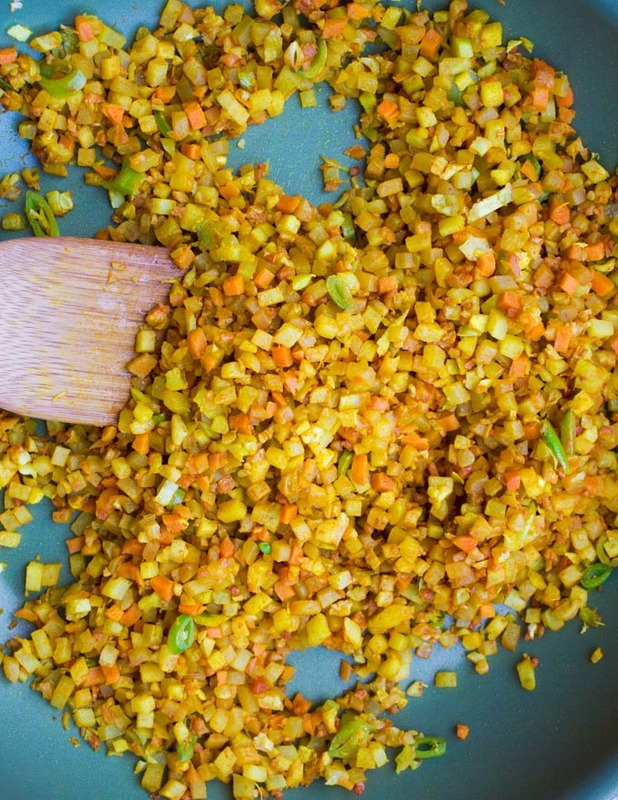 Turmeric has an amazing deep and smoky flavor which works beautifully with cauliflower rice. Similarly you could add nutmeg, chilli flakes and much more, but I chose to make it a really turmeric boosting cauliflower rice. Another thing you can play around with is how well you prefer your cauliflower rice to be done. For today’s platter with the kebabs, I prefer a soft well done cauliflower rice. But let’s say if I’m making grilled shrimp, a fresh side dish or a cauliflower rice salad, I certainly prefer the rice to be al dente. First of all, we’ll start with the kebabs. Season the meat with garlic, herbs, cinnamon, oregano, nutmeg, turmeric and a touch of cumin. 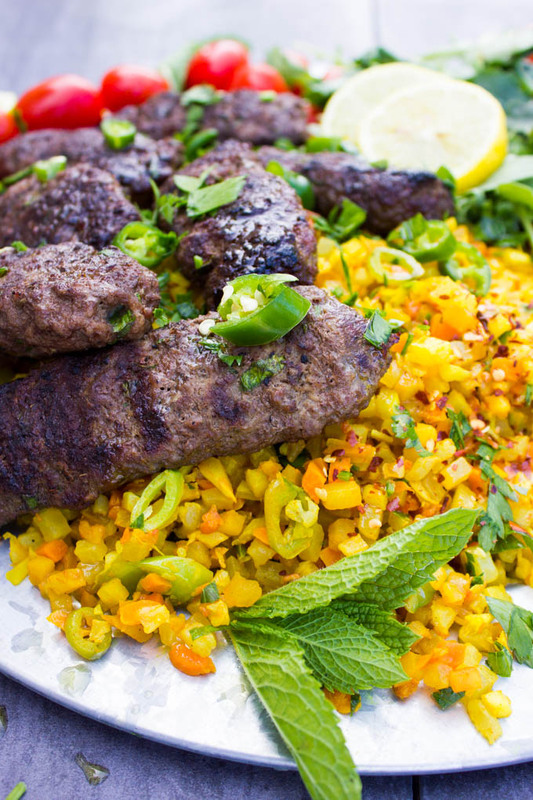 These kebabs have a zesty Moroccan flare which pair beautifully with the cauliflower rice. 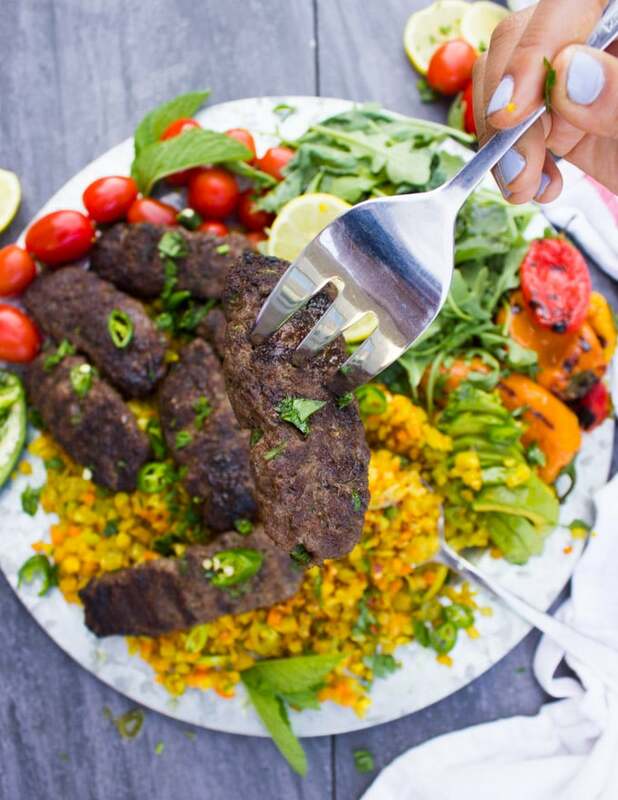 Shape the kebabs and grill them for 8-10 minutes per side, covering the grill most of the time so that the kebabs cook all the way through. Since this is a platter, there’s room to add more ingredients. I’ve added grilled peppers, avocado slices, arugula, cherry tomatoes, sliced green chillies and sprinkle of chilli flakes. Lately I’ve fallen in LOVE with summer entertaining platters like these. There’s room for everyone, and room for you to be as creative as you can. So maybe some cucumbers, hummus, tahini sauce, Greek salad..and more!! 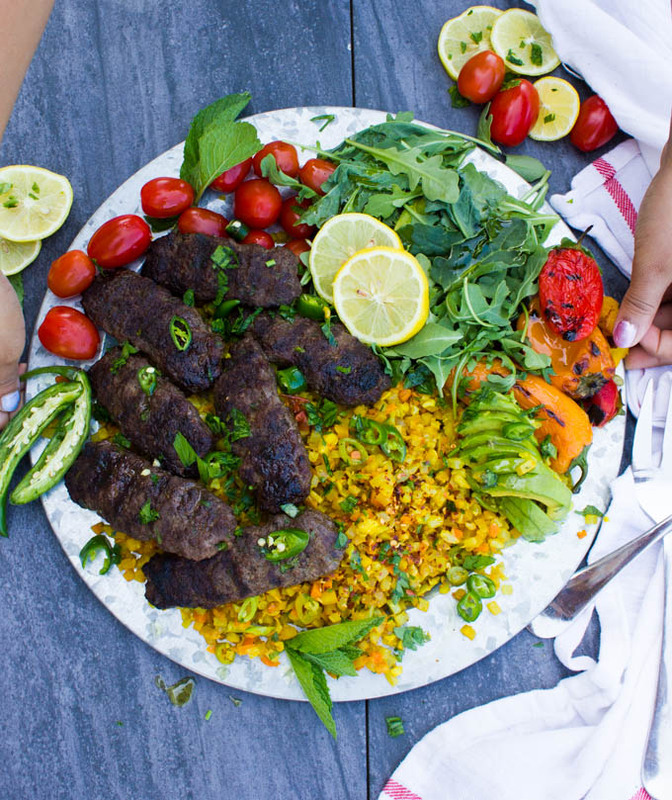 While the kebabs are on the grill, prepare the cauliflower rice, chop ingredients for the platter and start assembling. 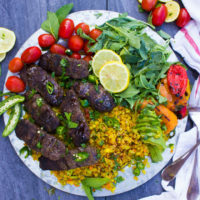 Finally, serve this zesty Moroccan spiced kebab and cauliflower rice platter warm, with drinks and plenty of fun! 🙂 Enjoy! 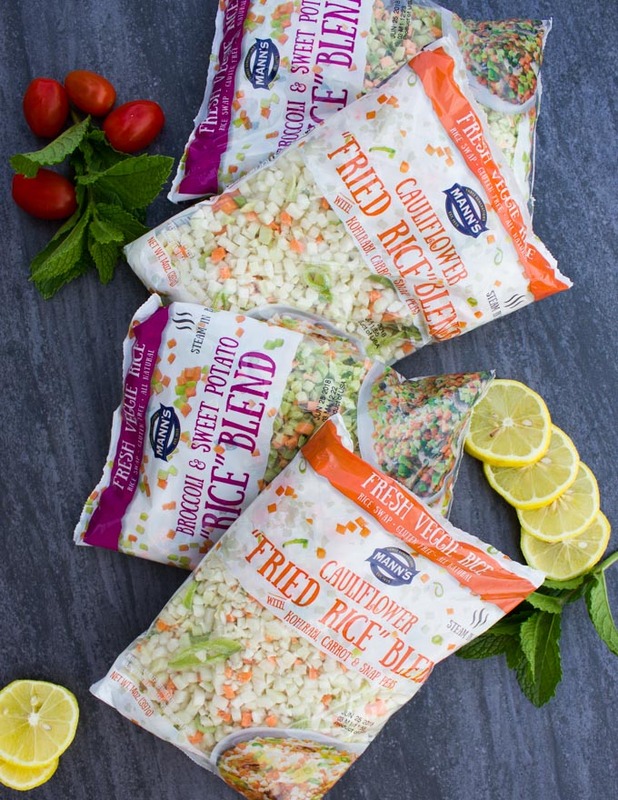 🙂 Don’t forget to check the new fried rice blends by Mann’s veggies, and tag me when you make this delicious platter so I can check out your creative platters too!! 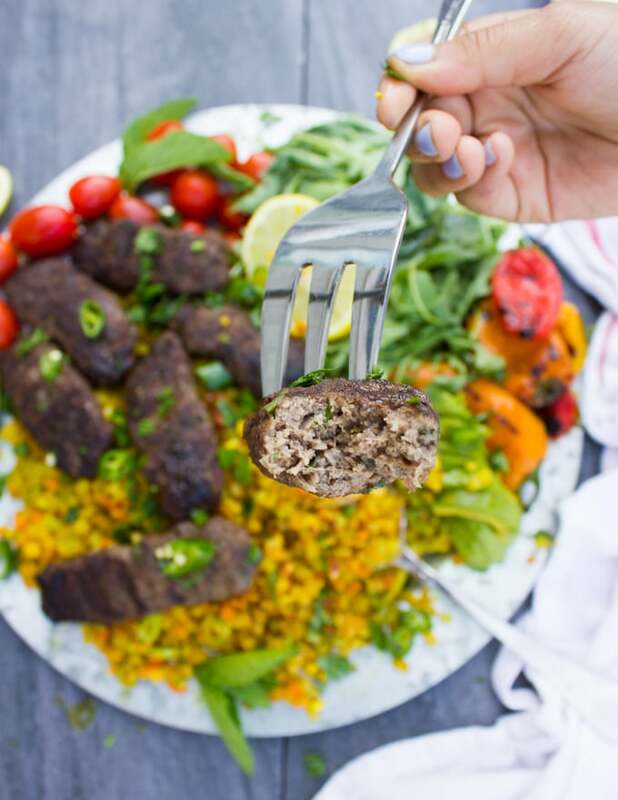 For the kebabs, mix all ingredients and shape into the kebabs—chose the shape and size you prefer, but make sure they’re all the same size so they cook at the same time. 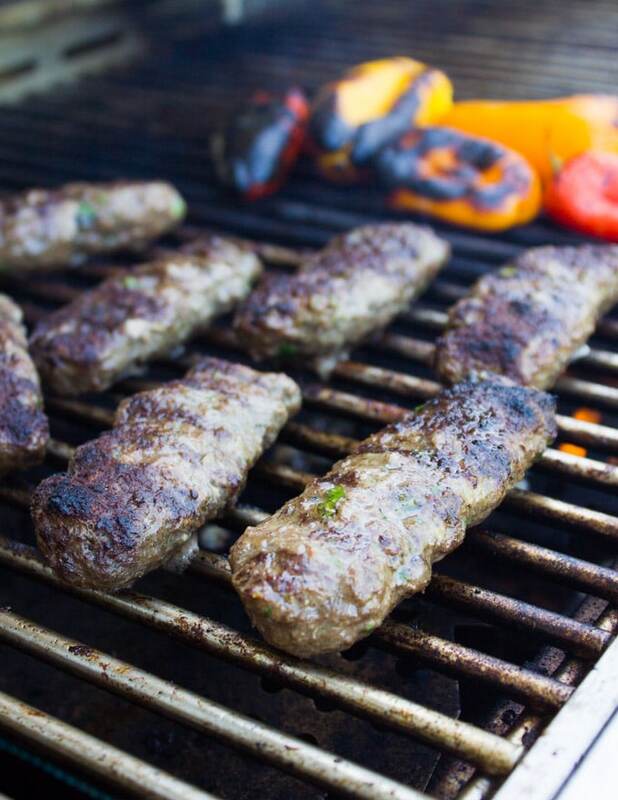 Preheat the BBQ to medium high and place the kebabs on the grill. Sear the kebabs for 3 minutes on each side and close the lid on your BBQ. In the meantime, make the cauliflower rice. Sauté garlic with the olive oil in a sauté pan for a minute. Add the Mann’s cauliflower rice blend and season with salt and turmeric. Give the rice a toss and cover the lid, then lower the heat to medium low and let the rice cook for 4 minutes. Alternatively you can place the bag of rice in the microwave and microwave for 4 minutes, then open the bag in a bowl and add seasonings (without garlic). Assemble the platter once the kebabs have cooked. Arrange al ingredients and all more of your favorites, and serve right away! 🙂 Enjoy!! You can cook the cauliflower rice in the microwave. YES. Just place the bag as it is in the microwave for 3-4 minutes until it puffs and the veggies are cooked. Play around with your platter and add on your favorite ingredients and spices to customize the platter.